When I first started hiring writers to work in the Realms of Pugmire, I knew I had to articulate the tone the game goes for. For years I got by with a sense of “I’ll know it when I see it,” but that wasn’t sustainable. Going forward, I had to spell out exactly how Pugmire uses concepts like grief, loss, and humor. So I wrote a lengthy essay/rant about the topic for my writer’s guide, and now I’m sharing it with all of you for the first time ever. Enjoy! Let me start by spelling it out: Pugmire is ultimately about the power and danger of nostalgia. Everything (intentionally or unintentionally) points back to this concept, whether it’s the fact that dogs worship an idealized humanity or the intentional use of Dungeons & Dragons as a mechanical base. That’s the secret lurking at the heart of this world — Pugmire is built to evoke fondness for what has come before. Taken a step further, nostalgia can be funny or it can be sad, and in an ideal world, Pugmire strives to be both. 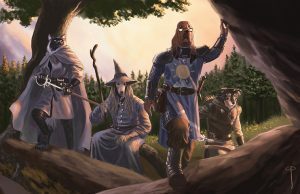 In the very first version of the game (ominously titled “The Fall of Pugmire”), the elegiac qualities were very strong, and melancholy has a strong connection with nostalgia. And the funny thing about nostalgia is that it works primarily because we don’t clearly remember all the details. Thus, a story evocative of nostalgia is not one that’s a slavish reproduction of what came before, but evocative of the high points, the parts that really resonated, the parts that mattered. That’s why the world of Pugmire isn’t exactly recognizable as our own, why the dogs aren’t exactly right about what humanity was, and why the game system isn’t exactly like old-school gaming. It’s the best bits of all of those things, blended together into one seamless whole. This also applies to the humor. If the meta-narrative humor drowns out the story context, then the humor has failed. “Be a good dog” works because the humor supports and reinforces the concept — there are plenty of comic strips that play off the religious overtones of the phrase, and that’s exactly where we go as well. Having a Shiba Inu head of the Church of Man with the title of “Doge” drowns out anything that character might do that’s narratively interesting. A few characters are intentionally humorous and can get away with more (look to Alastair Afghan as an example), but all in all the humor should work with the world concept, not against it. None of this needs to be done intentionally as you work on Pugmire. In fact, in my experience, it’s better if it’s not foremost in my mind when I write. But it does help when going back and deciding what makes for “authentic Pugmire” or not. Since this is an evolving property, my response to a lot of things will be some form of “I’ll know it when I see it,” but the above rant may help you to see it too, before it even gets to me. ◀ Now Available: Pan’s Guide for New Pioneers! If Pugmire is ‘Nostalgia + Humor’ then what is Monarchies of Mau? I have thoughts, but mostly I think: YES! YES! And of course, YES! Thank you.